The news media was abuzz when Marco Rubio received what likely is the most important endorsement of the 2016 political season. Courted by Bush, Christie, and even ‘The Donald,’ the man known by his colleagues as “The Vulture” was circled by many, but eventually he swooped in on Rubio. So who is this… Vulture? He was the man behind the Swift Boat Veterans for Truth, the man behind Mitt Romney, and the man that chose Paul Ryan for Vice President. The Vulture is well known for all of this, but the real reason why Paul Singer is important can be found here on GregPalast.com. 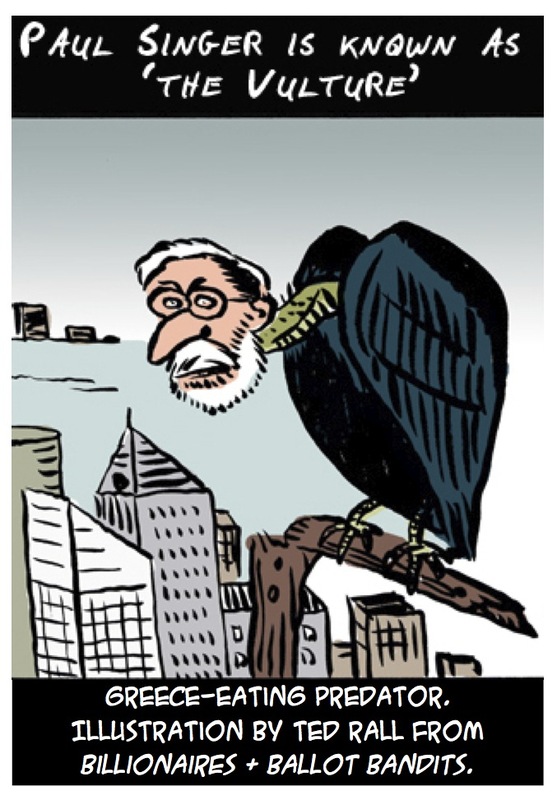 Watch our first ever investigation into this financial bird of prey below, and read more on how Singer has built his empire on the ruins of nations, the Congolese, and union workers. Greg Palast is the author of the New York Times bestsellers, Billionaires & Ballot Bandits, The Best Democracy Money Can Buy, Armed Madhouse and the highly acclaimed Vultures’ Picnic..